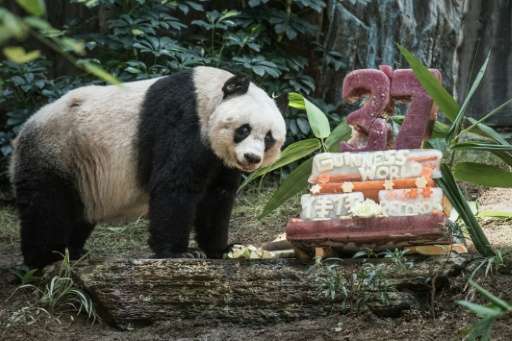 It may not be considered a landmark birthday for humans, but turning 37 on Tuesday made Hong Kong's Jia Jia the oldest-ever giant panda in captivity, and she celebrated in style. 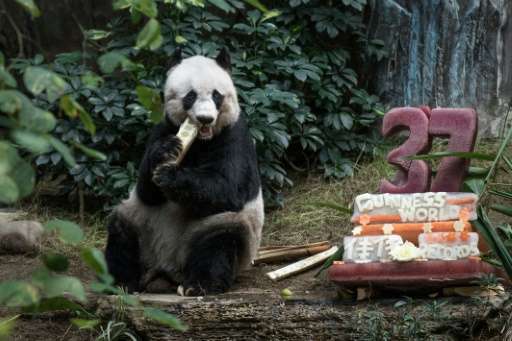 The equivalent of more than 100 years old in human terms, Jia Jia was presented with a towering birthday cake made from ice and fruit juice with the number 37 carved on top in her enclosure at the city's Ocean Park theme park. "Jia Jia has achieved two Guinness world record titles—the oldest panda living in captivity and the oldest panda ever living in captivity," said Blythe Ryan Fitzwilliam, adjudicator of Guinness World Records, during a ceremony at the park. He offered her his congratulations, saying it was an "amazing longevity achievement". Jia Jia was born in the wild in Sichuan, China in 1978 and was given to Hong Kong in 1999 to mark the semi-autonomous city's handover by Britain two years earlier. The previous record was held by a male panda called Du Du, who was also caught in the wild and died in July 1999 at the age of 36 in a zoo in China's Hubei Province. Vet Paola Martelli said Jia Jia was still "moving about" though she suffered from cataracts and high blood pressure. "She is sleeping more, so is doing everything less. But she is ageing gracefully, just like your grandma," she said. Because she eats less bamboo she relies on fibre supplements, Martelli added. Jia Jia, whose name translates as "excellence", picked at fruit slices and bamboo around the ice cake to celebrate her big day. Although the exact birth dates of Du Du and Jia Jia are unknown because they were born in the wild, Guinness said that based on the evidence, they've concluded that Jia Jia had claimed the title by a few months. There are fewer than 2,000 pandas now left in the wild, according to the World Wildlife Fund, as their habitats have been ravaged by development. Roads and railways cut through the bamboo forests they depend upon in China's Yangtze Basin, their primary habitat. Pandas rely on bamboo and eat almost nothing else. Given their low birthrate, captive breeding programmes have become key to ensuring their survival.